RE Sources for Sustainable Communities: The demand-side question: Is all that coal to make stuff for us? The demand-side question: Is all that coal to make stuff for us? If Whatcom’s proposed coal port is approved as many as 18 more trains per day will pass through Bellingham, all to feed the coal-fired power plants of Asia. In exchange for all this coal we get flat screen TVs, plastic bags, toys, and millions of other disposable products being made for the “consumers” in our “market”. But that’s not all! We also receive a growing volume of polluted air blown here from Asia, and the related toxic deposits in Lake Whatcom, the drinking water source for most of Whatcom county. But before we cast stones, we’d do well to examine the glass house of affluenza that America has become. As the virus spreads among us, we pay little attention to consequences. Since World War II, Americans have consumed more resources than everyone who ever lived before then. We have reduced our fisheries, soils and fossil fuels by half, caused the extinction of countless species and dramatically changed the climate. Already, according to the Global Footprint Network, if everyone were to suddenly consume as Americans do, we would need four more planets to provide the resources and absorb the wastes. Technological improvements alone will not change this; we need to consume less. To ensure our right to all the stuff we have come to expect, we are cutting off food stamps for the hungry while reducing the taxes of millionaires and subsidizing our wealthiest farmers. To ensure the resources to continue our binge, we mine coal from the Powder River basin and poison its waters, frack recklessly for natural gas, and haul fossil fuels through our cities, leaving a trail of danger and pollution in the wake. As a community of consumers we have a responsibility to look at the connection between the coal and oil trains we’re concerned about and the demand for products that necessitates them. We have discovered there is enough supply of carbon based fuels – enough to choke the planet. Now it’s the demand side, and our part in it, that we need to question. The message of AFFLUENZA: HOW OVERCONSUMPTION IS KILLING US AND HOW TO FIGHT BACK is simple: we don’t need to engage in this reckless behavior in order to live well and be happy. We don’t need to poison our drinking water in order to have a green lawn. We don’t need to threaten Whatcom county’s environment to provide jobs. We don’t need to compromise our parks and waterfront to transport coal. We don’t need to strip the planet of its natural resources in order to feed the insatiable appetite for more and more stuff. What we need most in the age of affluenza is not more stuff but more time, not more work but satisfying low-carbon leisure, not the right to get rich but the right to live securely in modest comfort and good health, with pure food, air and water, connected to community and friends and nature. 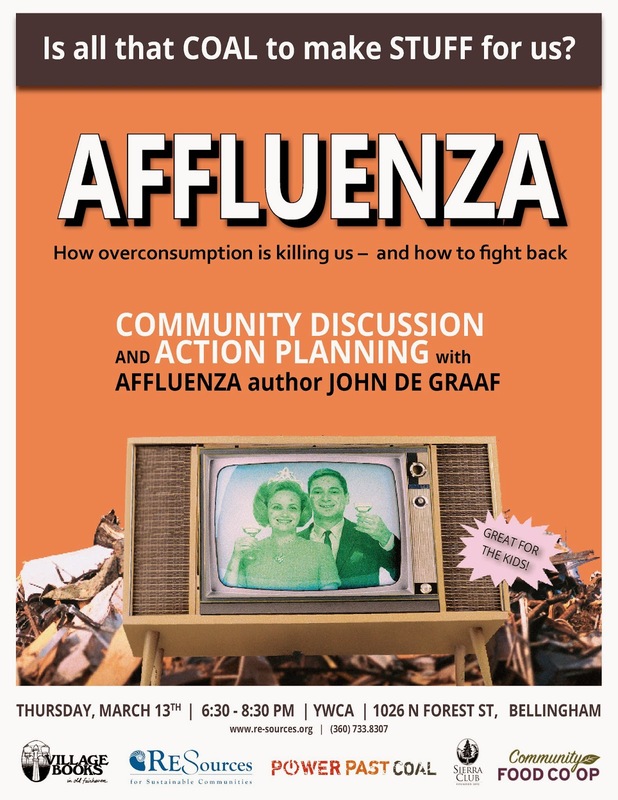 Join us Thursday, March 13, at the YWCA 1026 N. Forest in Bellingham, for a community discussion, action planning, and vaccinations against affluenza in our community. John de Graaf is a documentary filmmaker of dozens of prime-time national PBS specials, co-author of the books Affluenza and What’s the Economy for, Anyway?, and a noted public speaker. Crina Hoyer is the executive director of RE Sources for Sustainable Communities. RE Sources promotes sustainable communities and protects the health of northwestern Washington’s people and ecosystems through application of science, education, advocacy, and action.